How can you have a blue sky in a room with no windows? How can you make your ceilings and walls come to life? There have been hundreds of research reports showing the positive effects of incorporating healing art and biophilic friendly products into healthcare design. Biophilia, most easily defined as "the love of nature", is the idea that people function best in the natural, green environments we evolved in, with other life around and with spaces that are more like natural habitats rather than boxes with dull, lifeless ceilings and walls. Biophilic design accompanies green building perfectly because its products are sustainable, blurring the boundaries between building and landscape to relax and soothe the soul. Even though people may be happy in a suburban bungalow or urban high-rise, we are most at peace when walking in a park, looking at the ocean or hiking in the woods. Biophilic spaces can reduce unnecessary stress and depression, enhance positive social response, speed up recovery times, provide medical patient distractions, increase staff productivity, increase retail sales, encourage educational growth in students and even make tight, claustrophobic spaces seem wide open. Best of all, our products are maintenance free and will provide years of enjoyment for customers and staff alike. With a ceiling mural overhead, you will immediately SEE the advantages. 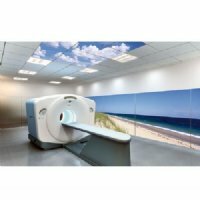 The future of radiology departments is not only new imaging equipment, it is focused on becoming more patient-care oriented. A typical MRI or CT Scan can terrify the bravest souls and cause not only unnecessary stress, but delayed recovery times. A relaxed patient is more receptive, therefore they are more responsive to treatment. State-of-the-art, user friendly environments are a positive marketing tool and a strong facility competitive edge. Viewing nature imagery reduces systolic blood pressure and pulse; helps redirect negative thought and decreases boredom. How can you have a blue sky in a room with no windows? How can you make your ceilings and walls come to life? With dropped ceiling tile art and decorative wall murals!